The closest nature reserve to where I live is called Neu-Lindsay, and it’s the self-styled home of the great green bush cricket. Somehow, in almost six years of living in our valley, I’d never been there, so it felt about time. 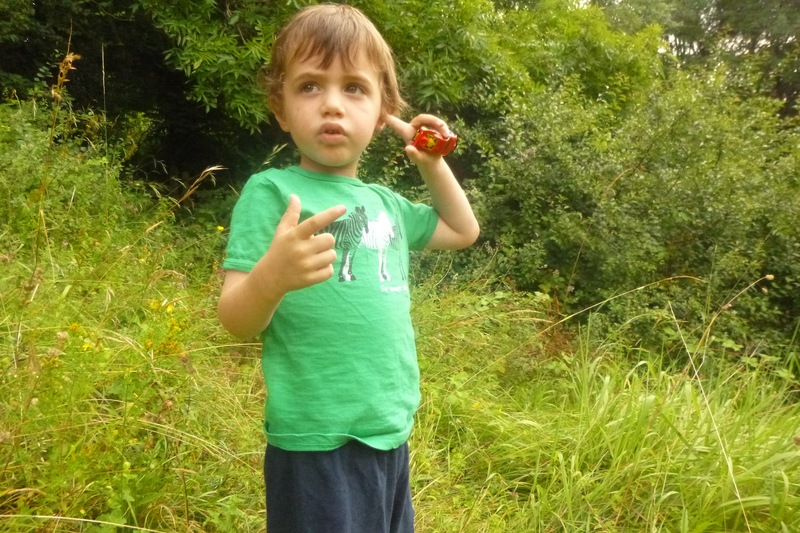 “We’re going in search of the great green bush cricket,” I announced to my three-year-old, Mungo. “No, no, don’t like it!” he wailed, looking despondently at first his trains, then – in some hope she might avert the impending catastrophe – his mother. 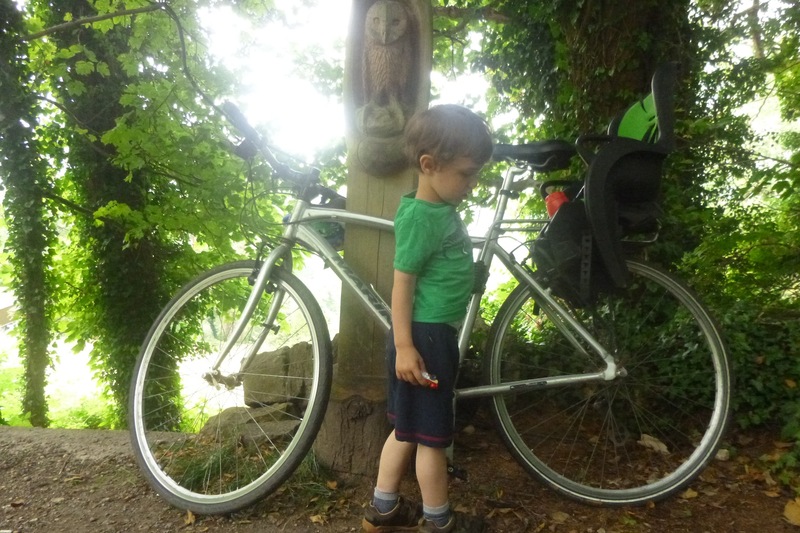 But Mungo is an accommodating little boy, and by the time I’d strapped him into the child seat on the back of my bike and not – like his mother has been known to do – pinched the oh-so-tender skin on the underside of his chin with the helmet strap, he seemed quite content. And, then we – well, I – huffed and puffed our way the half mile or so up Culver Hill. Neu Lindsay is what conservationists call a hay meadow. Take a picture of it, and it looks unremarkable – little more than a field of grass that hasn’t been cut or grazed for a year or two. You only really see the flowers properly if you focus your gaze on little metre-square grids. 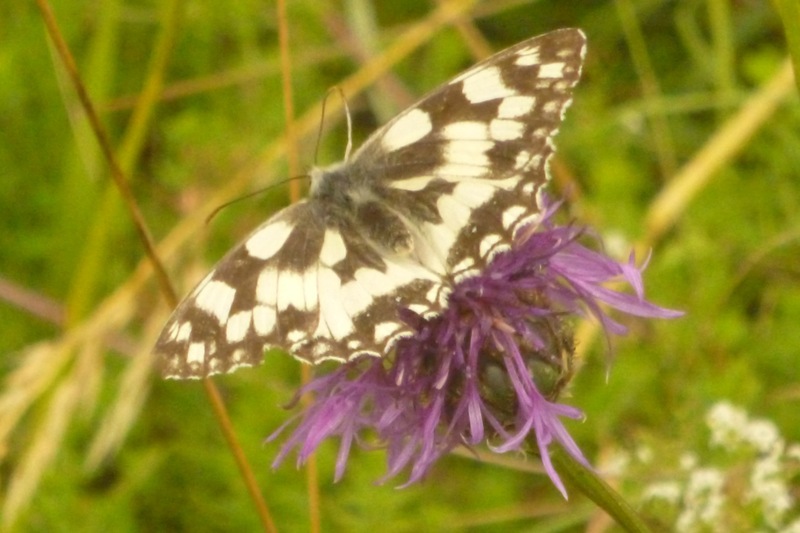 And then you see the insects – bees, hoverflies and of course butterflies, like this splendid marbled white. 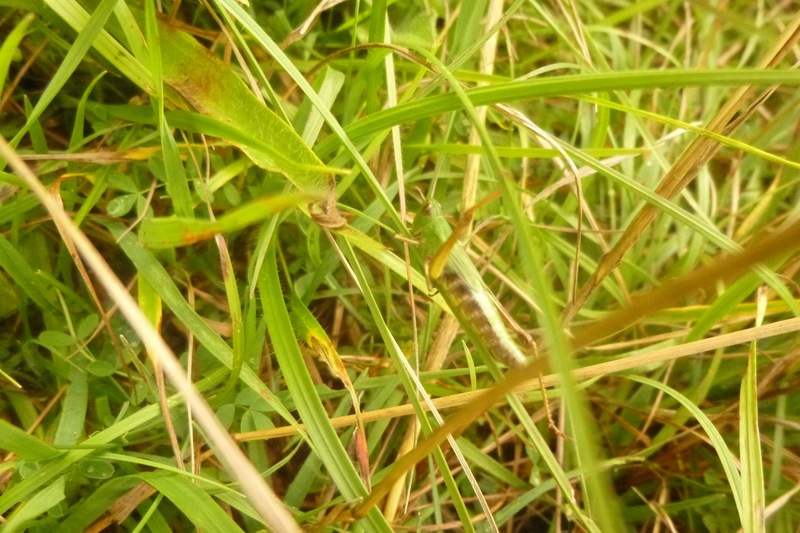 And there were critters moving in the long grass. Cricketty critters. “Look, Mungo!” I cried. But it wasn’t particularly great, and definitely not green. 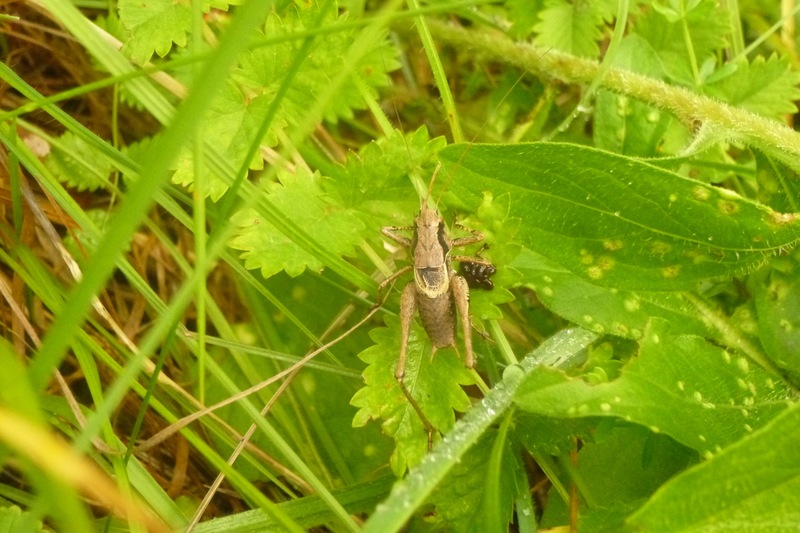 Never mind – we had plenty of time to find the great (and green) bush cricket, we weren’t in any rush. “We go home now?” Mungo said, as he gazed fondly at the small red car clutched defiantly in his left hand. 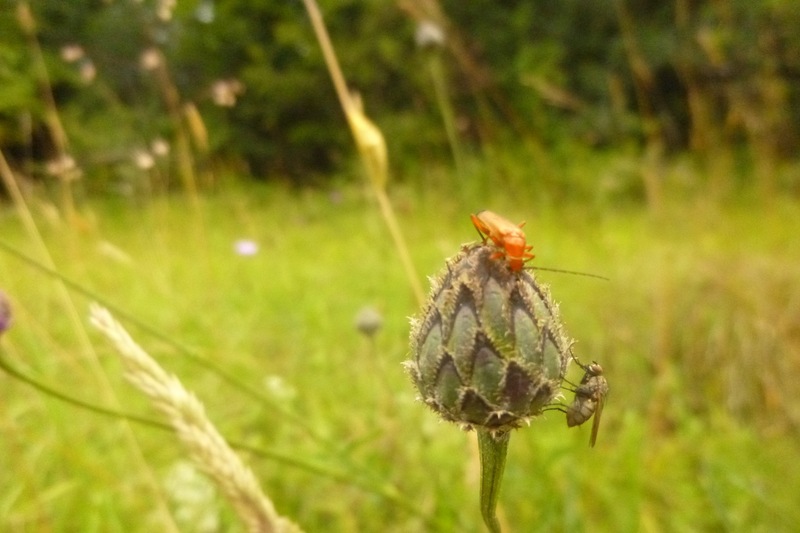 Still, we had some fun watching this red soldier beetle inspecting a seedhead. 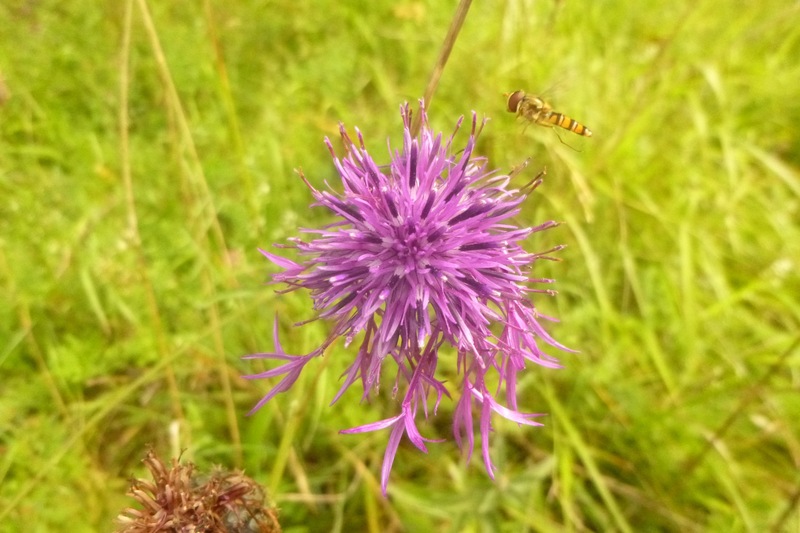 And this hoverfly looking for a meal from a knapweed flower. Eventually, we even found a properly green cricket, but sadly it wasn’t especially great – or, in truth in this photo, very visible. You sort of have to trust me that there’s a cricket in here somewhere. By now, Mungo really had had enough, so I promised him by way of reward a trip to the village post office where we could buy some chocolate rabbits – or possibly hares, it’s hard to tell. With Mungo revived by the chocolate rabbits (or possibly hares), I decided to push ahead with my threat to investigate a nice meadow in the ‘upper reaches’ of Boundary Court, a National Trust property above North Woodchester that briefly made national headlines in January 2012 when it was the location for a suspected big cat kill. Despite the hype, scientists eventually decided that it had merely been foxes all along. On the way up to the meadow, I was delighted to find this beautiful butterfly on a shady part of the path. 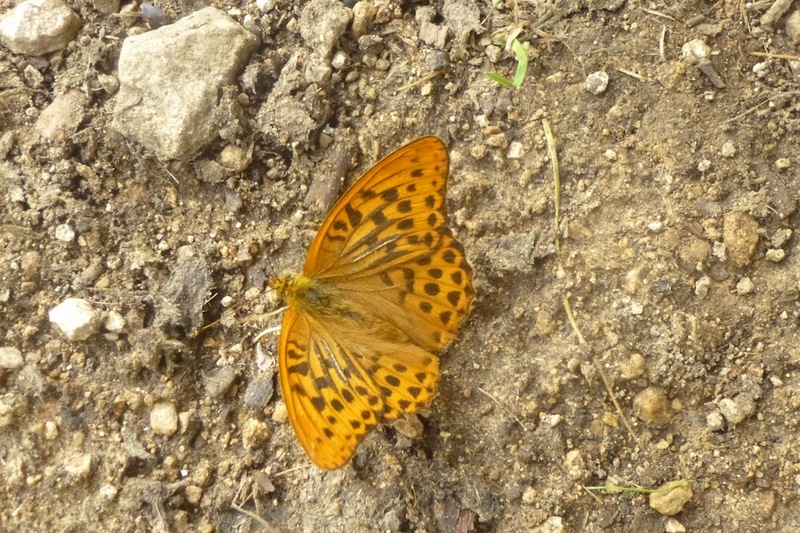 I later identified it as a silver-washed fritillary. 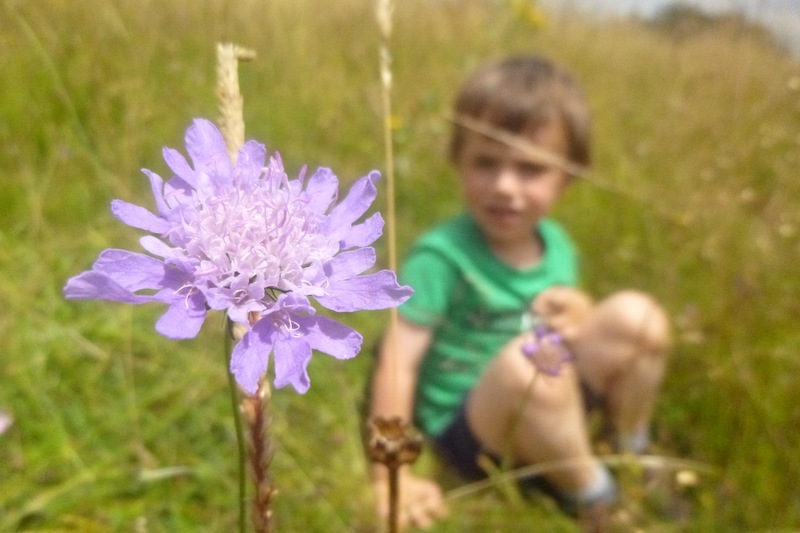 The meadow was alive with marbled white and gatekeeper butterflies, but they were in a jittery mood, so I contented myself with taking a photo of this gorgeous field scabious. But it was time to go. 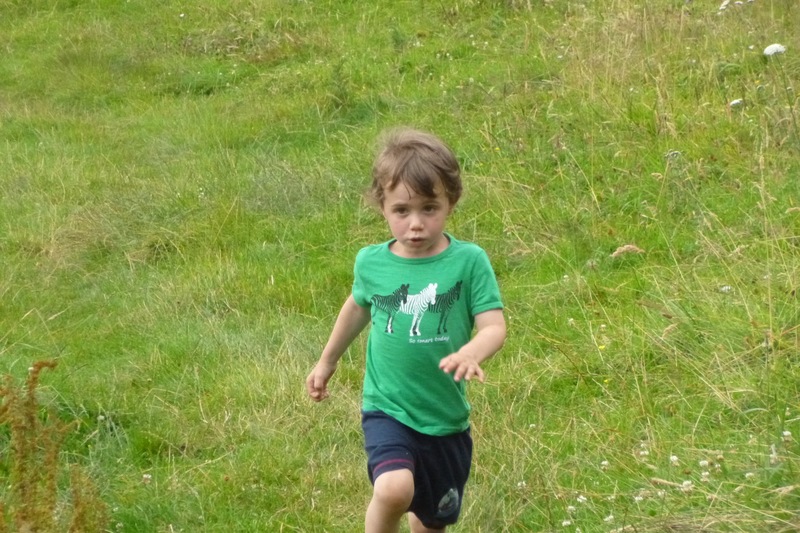 If there’s one thing I’ve learned from doing ‘In search of the Gruffalo’, it is that you shouldn’t over-exploit your child’s hesitant interest in natural history. Insects are never going to be as intriguing to my children as trains, trucks or traction engines. So, when I said it was time to head back, it definitely put a spring in Mungo’s step.